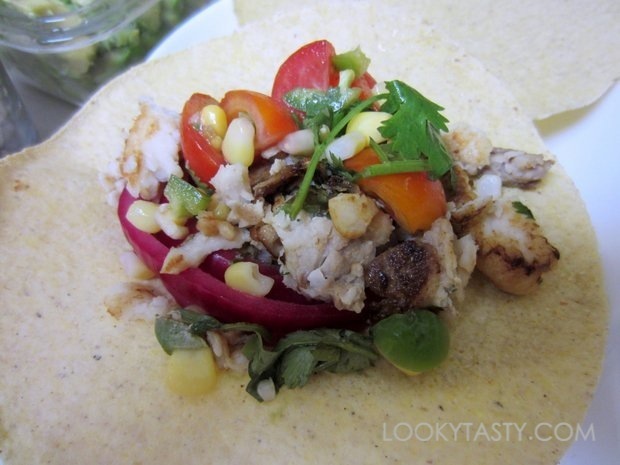 My other Plated dish for this week was two plates of the Tilapia Fish Tacos with Corn-Tomato Salsa and Avocado. 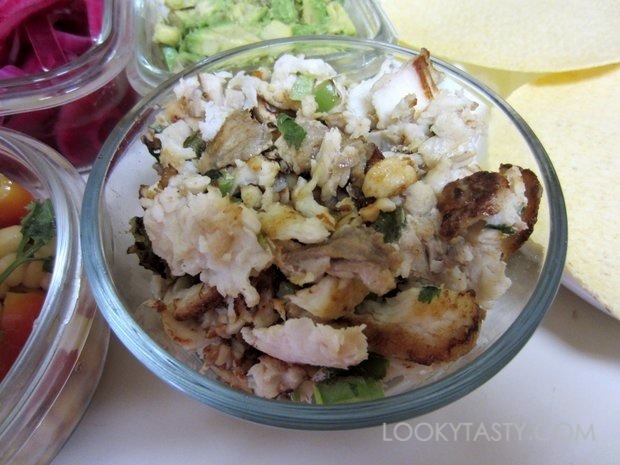 This recipe calls for a little more preparation time since it involves quick pickling the onions and marinating the fish. The two tilapia fillets were individually stored in vacuum sealed pouches. 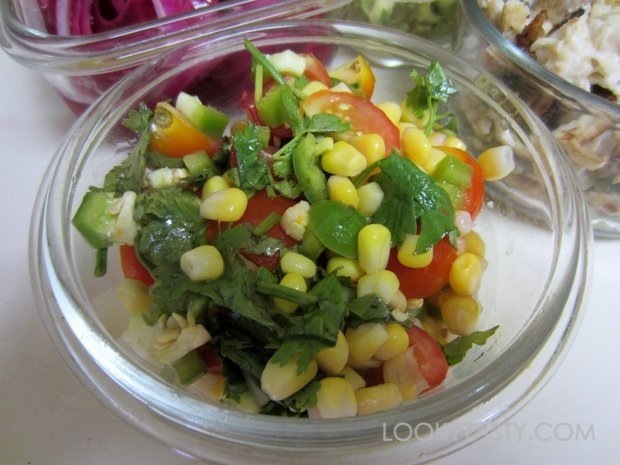 The corn-tomato salsa was very simple to make and just required some chopping and mixing. A few of the cherry tomatoes were a bit bruised, but that didn’t affect things much. For the yogurt sauce, the meal kit came with a small container of Chobani plain Greek yogurt. There was also a nicely ripe avocado, along with 6 corn tortillas. In addition to providing step-by-step illustrated directions for preparing the meal, the recipe card also provides some relevant cooking tips. Since this recipe called for picking the onions, the card included a couple sentences on the pickling process. Pickling is a preserving technique in which you soak ingredients in vinegar and sugar or salt. 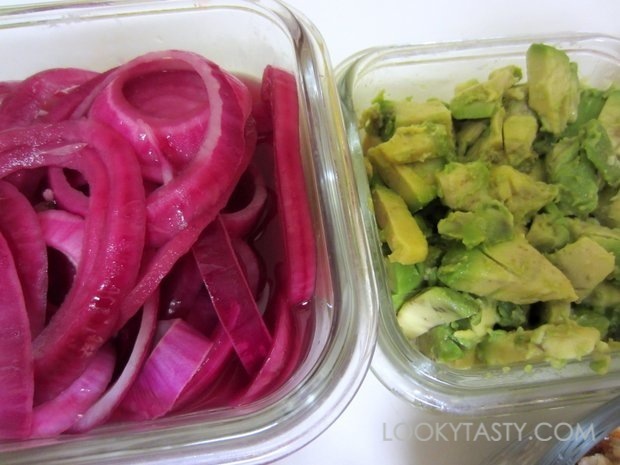 By thinly slicing the red onion in this recipe, the pickling process is sped up, resulting in quick picked onions ready in about 30 minutes. The recipe suggested pickling the onions for at least 30 minutes. I actually had them sit in the fridge, covered, for about 12 hours. From previous experience, the taste is much stronger and better when it sits in the vinegar mixture for at least overnight. They also provided a cooking tip for cooking with avocados. As you might notice, the avocado will start turning brown once you slice it open. To prevent this, you can squeeze some lemon or lime juice over it. Doing so will slow down the oxidization process and keep the avocado looking more appetizing. 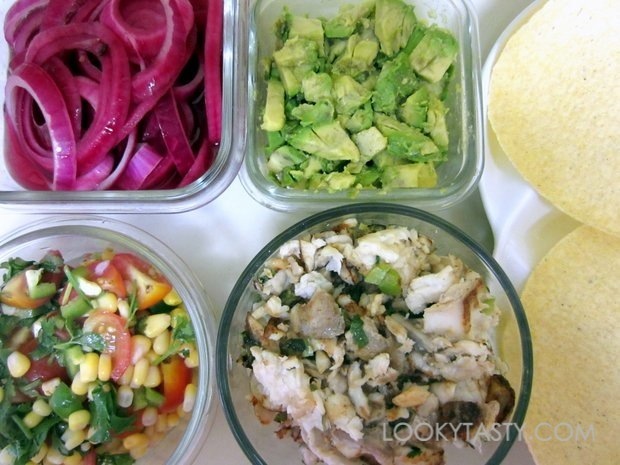 Once I had everything prepared, the fish cooked, and the tortillas warmed, I laid out each component on the table. It was time to assemble the tacos! This was another dish that’s simple to make. The combination of ingredients tasted great. It was surely helpful to have the ingredients already portioned out. That way, you don’t have to measure anything, or worry about adding too much or too little of particular ingredients. Also, the dish can be easily customize, giving the user the option to include or exclude, or substitute particular ingredients. In terms of price and value, the cost of each plate averages to about $10-$15 depending on membership/subscription options. 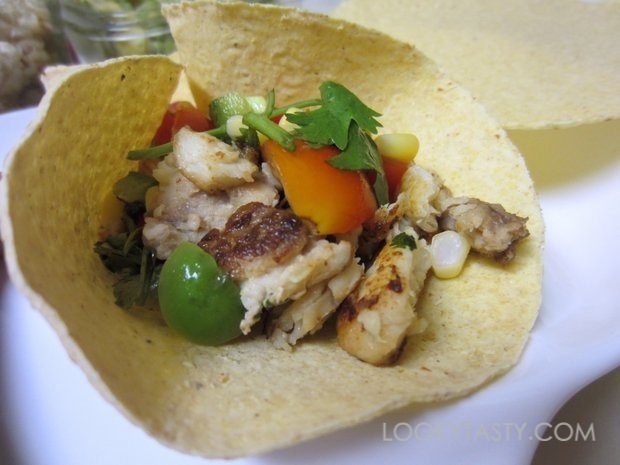 For this dish, the recipe makes two plates, where each plate consists of 3 tacos. I guess the price might be about the equivalent of ordering a similar dish at a casual restaurant, bar, or cafe. So while the price might not have gained any convenience, other than the grocery shopping, it’s nice to know where your fresh ingredients came from, learn a new dish to prepare and some fun facts, and simply have fun cooking. If you’re interested in trying Plated, here’s $10 off your first delivery. The menu changes every week and service is currently available in most areas in the Northeast and Midwest.